Your master bedroom should be a retreat for you and your partner, a room where you can relax, unwind and be romantic with your partner. Now that your Nest is empty you have so much more time to enjoy your partner and your bedroom! If that seems like a lot to ask of a bedroom, let me assure you that your master bedroom can be the foundation to connecting with your partner. If you and your spouse feel more like roommates than partners after all those years of carpooling, keeping your kids fed, clothed and alive, it’s time to reconnect and bring some romance back into your relationship. Unsure where to start? How about creating a master bedroom that nurtures your relationship. Here’s how! Create a dream list. Find a time to sit down with your partner and imagine all that your master bedroom could be! This is a great time to dream together about how you want to use your master bedroom, how you want it to look and how you want it to feel. Look at images of bedrooms that inspire you to help you imagine the possibilities! If your bedroom has become a “catch all” room for things that didn’t have anywhere else to go (maybe gym equipment, a bookcase full of old books or desk you don’t really use), consider where else you could put those in your home — maybe reclaim one of the kid’s rooms for a small gym, office or library space! What you take out of your bedroom is just as important as what you bring in! Update your mattress & bedding. Now to the bed, the main feature of most bedrooms! Is it time for a new mattress? If so, schedule a date to go mattress shopping and grab lunch while you’re out! If your bedding could use an update use your picture inspiration images to guide you toward a new look for your bedding. Consider new pillows to support your sleeping habits and get high quality sheets that make you love getting into bed every night! Electronics - yes or no? It’s hard to get away from electronics these days! Consider how you feel about electronics in the bedroom. If you love watching movies in bed, then having a TV in the bedroom is a great idea. Or, would you rather not have a large screen in this room and make it an oasis for reading and conversation? Since many of us use our phones as alarms now, it may be unrealistic to ban phones from the bedroom. If you feel like they are getting in the way of your intimacy though, consider setting guidelines for use to help you reconnect and better your sleep! Light up your room! Lighting is so important in a bedroom. It should both set a mood and be ready to help you with tasks (reading, getting dressed and putting on jewelry). To get your lighting just right, note all of the things you’d like to do in your bedroom and consider how each area is lit now. Do you often find yourself wishing you had more light in one are of your bedroom? For example, if you love to read in bed, consider adding reading sconces that can be directed right on your book. These can be used in conjunction with bedside lamps, which aren’t always great for reading but are good general illumination light sources. If you need light at your dresser area for picking out jewelry consider adding a lamp to your dresser. If your lighting is functioning well for you now, maybe it’s time for updated fixtures to update the look of your room. When possible, place all lights on a dimmer! Color palette. The colors in your bedroom really impact your mood. When you consider how you want your master bedroom to feel, think about what color your room is painted and if a new color will make the room feel even better. What colors do you and your partner both like to create the feeling you want? Designer Bestie tip - select your paint color after you select your bedding and select a color that both coordinates with the bedding and sets the mood you want in the room! If you select your paint color first and then try to find bedding it can be harder to find bedding you love and that looks great with the wall color you picked. Display art you both love. Do you have art on your bedroom walls that you both love? Or, is the art hanging in your room something you’ve had there for years and don’t really think much about? Adding art you love really personalizes your room and brings it to life. If you would like new art for your bedroom make this a fun project for your and your partner (much more fun than shopping for a mattress!). Find local galleries and begin visiting them to see what you both like and don’t like! When you find an artist you love consider adding one of his/her pieces to your bedroom. If it’s a local artist find out if he/she has any more shows or signings - this can become a great shared interest with your partner! What’s splurge-worthy!? If you’re like most people, your master bedroom is the last space in your home that you spend time decorating. We spend a lot of time on the spaces that other people see, but when it comes to our private spaces, we often push those to the back burner. Years of raising kids also prevents people from spending any time considering their bedroom! Now is the time to not only focus on you, your relationship with your partner and your enjoyment, but it’s the time to splurge on the most important thing in your life - your partnership. Your master bedroom is one way you can splurge on that relationship. What are your favorite indulgences? Favorite things you’ve seen in high-end hotel rooms? How can you include one or more of those indulgences in your master bedroom? Maybe it’s a very high-quality sheet set, making room for a masseuse to come into your bedroom once a month for a couples massage, maybe it’s a custom jewelry armoire for your treasures. How can you bring a little bit of indulgence and luxury to your master bedroom and relationship? Isn’t it exciting to think about how great your master bedroom could become if you gave it a little attention. It’s also exciting to think that you could enhance your relationship with your partner during the process. It’s time to focus on you & your marriage! 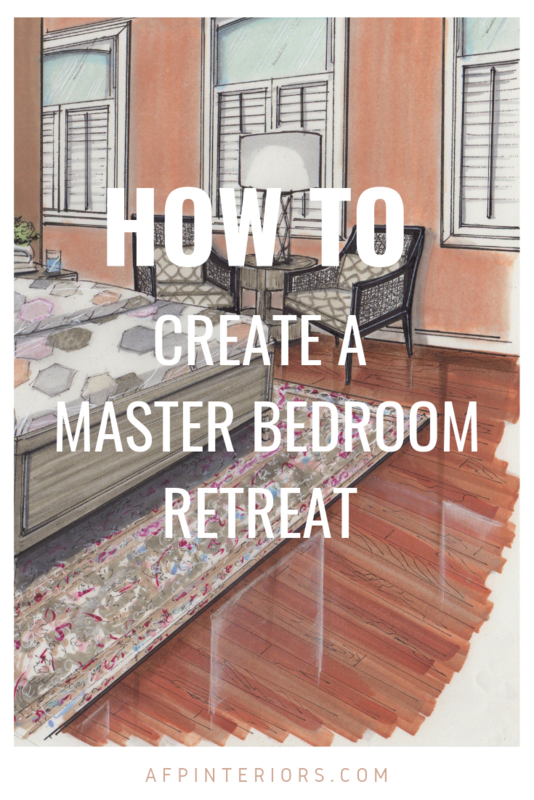 Download my Master Bedroom Retreat Worksheet to help you create a master bedroom that enhances your relationship!